I like books. I don’t mean I just like reading books. I mean I like books. It just feels wrong to me to read a book off of a computer screen. I like to turn the pages. I like to feel it in my hands. I like to find some odd piece of scrap paper or some random bookmark to hold my place until I can start reading again. I like to see books sitting on my bookshelf, whether I actually read them or not. Because of this, I love to randomly cruise bookstores. I hardly ever buy anything. It’s odd. I can watch a movie multiple times and not get tired of it, but once I finish a book, well, I’ve finished it. I don’t pick it up and read it again. Nevertheless, I still like to rummage through bookstores, and occasionally I will actually spend a little money on something to read. 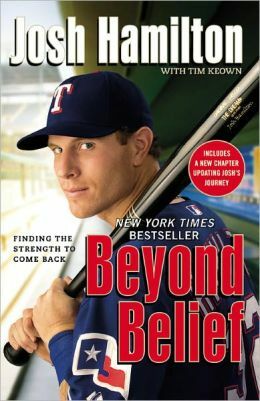 One of my purchases last year was Josh Hamilton’s autobiography Beyond Belief. The book had been out for several years, so I was able to snag it cheap at the local Books-A-Million. Hamilton was still a member of the Texas Rangers when the book was published, before he signed a mega-deal with the Los Angeles Angels of Anaheim in 2012. I had a little money with me and had always wanted to read it, so I bought the paperback edition. By now, even non-baseball fans know Hamilton’s story of being a five-tool prospect to bottomed-out drug and alcohol addict who was booted out of baseball completely to born-again Christian who rose from the ashes of his own story to return to the major leagues and become a star player. It is a truly inspiring story, a light of hope for anyone who has ever sank to the depths of addiction and wondered if they could ever recover again. On the left side of the book’s cover, there is a small, red circle. Typed in white letters are the words “Includes a New Chapter Updating Josh’s Journey.” This update comes in the form of an epilogue added to the end of the book. In the epilogue, Hamilton and his wife, Katie, recount his 2009 relapse, during which he was photographed shirtless in an Arizona bar with several women. Unfortunately, the events described in that epilogue would not represent the last time Hamilton would relapse. Major League Baseball officials are currently debating whether or not to suspend Hamilton for admitting to abusing alcohol and cocaine this past February. At issue is whether the incident constitutes a violation of the drug treatment Hamilton was required to be a part of to be reinstated to baseball in 2006. He could be facing up to a year’s suspension from the game. We Christians love heroes. We love to celebrate stories of recovery, and we love to push those who have those stories out in front of the crowd. When one of them falls, the public fallout can be vicious. Christians and non-Christians get angry. At the heart of their anger is this: That person claimed to be one thing and turned out to be another. Obviously, Hamilton’s latest relapse is a stark reminder to Christians everywhere that no one is above a fall from grace. It is also a reminder of why people become Christians in the first place. We’re going to get it wrong. We’re going to stumble from time to time. Sometimes we may not even be stumbling; we may just want to leave the narrow way for a while. Whatever the case may be, we are not going to be perfect. Christians often try too hard to find heroes. There is a distinct difference between appreciating someone’s story of redemption and making them a poster boy of faith. In doing so we put the emphasis on their lives and their works, and take it off of God’s grace. Grace is the differentiating characteristic between Christianity and every other religion, and when we downplay it we actually lose our witness. So how do we respond when one of our heroes relapses? We see ourselves in it and recognize the universal, deep need for God’s grace. This is what sets us apart and it’s what Josh Hamilton (and you) need now. I remember talking with a friend once about this particular issue. I told him I thought it was interesting that all of the Christian testimonies I hear are from people who have totally overcome their issues. Wouldn’t it be odd, I asked, to hear a speaker say that they were still struggling with sin? No one would want to hear that, even though it would be totally identifiable for scores of people. People forget that Josh Hamilton had to be accompanied by a handler everywhere he went, couldn’t have cash on him, and had to submit to weekly urine tests to keep his job. It’s not like he was an addict and walked away scot-free. That seemed to be how we all wanted to view him, though. There could always be an epilogue to anyone’s inspiring story. King David did a lot of wonderful things … then he saw a woman bathing on her roof. Noah was the only righteous man on Earth … then he got drunk. Hamilton’s story continued after the epilogue. Everyone’s does, even if they fall a thousand more times. Whatever Hamilton’s ultimate punishment may be, the grace that saved him will always be there. Just like it is for the rest of us.